Solo (or Surakarta) is a city of half a million people in central Java with a rich history, long a center of Javanese identity and tradition, second only to the better known Yogyakarta. 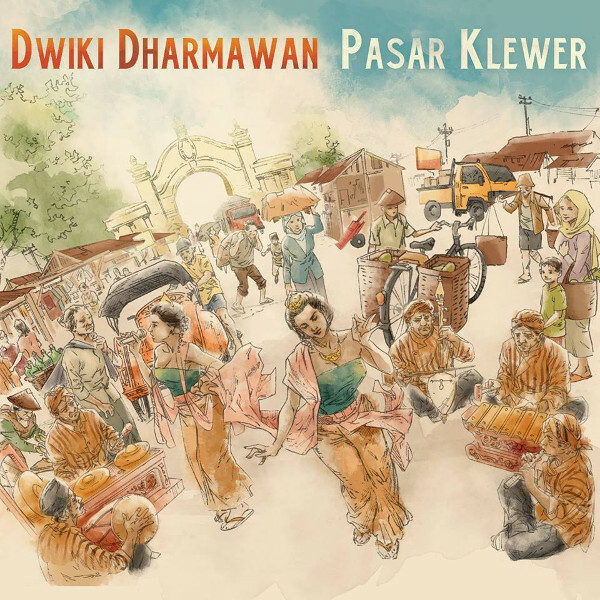 Pasar Klewer is a large open air market there where one can find just about anything, in many ways like the album at hand, where pianist and composer Dwiki Dharmawan presents a set that is nominally jazz, but there is no mistaking its traditional Indonesian roots in the undercurrent of nearly every tune, along with a sampling of elements of other styles, presented through his visionary filter. His trio features bassist Yaron Stavi and drummer / percussionist Asaf Sirkis, and on this two disc set they are joined by a number of other players and vocalists, track depending, including guitarists Nicolas Meier and Mark Wingfield; clarinetist / saxophonist Gilad Atzmon; Aris Daryono, who provides vocals and plays gamelan and kendang percussion, and rebab (a traditional three string violin) on a number of tracks; singer Peni Candra Rini on the beautiful traditional disc 2 opener “Lir Ilir;” Gamelan Jess Jegog (a gamelan orchestra) on the brilliant “Tjampuhan;” and Moonjune stablemate Boris Savoldelli sings on the last two tunes on disc 1, including Robert Wyatt’s “Forest” and the Wyatt-inspired “London in June” composed by the trio. Magically inspired compositions and playing can be found throughout these two discs, it’s hard to choose a favorite when so many of these pieces stand out to the degree that they do, but mention must be made of the powerful “Bubuyu Bulan,” a Benny Corda composition arranged by Dharmawan, where Atzmon turns in some stunning work on clarinet, and the follow-on “Frog Dance,” where some Balinese tree frogs even get in on the act, also featuring Atzmon on soprano sax. The oddest track here has to be the vocal version of “Forest,” with Savoldelli singing (there is an instrumental version also that closes disc two), if only because it just doesn’t seem to fit in with the other material, although after about a dozen plays it has definitely grown on me. Beginning to end, this is a monument to the fusion of modern jazz and Indonesian traditional styles, and a strong candidate for my best of 2016 list.